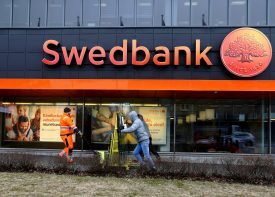 The Swedish lender has dismissed CEO Birgitte Bonnesen shortly before its annual meeting. That was almost inevitable given allegations that the lender was involved in money laundering in the Baltics. The problem for investors is that the scandal will last longer than her tenure. TPG’s Bill McGlashan and actor Felicity Huffman are among the big names charged in an alleged scam to get their kids into top U.S. universities. The admissions process is anyway tilted toward the rich. This case, and the entitlement on show, should put the whole system on trial. The bank at the centre of a money-laundering scandal saw its cost of issuing risky debt more than double. Still, its yields are far below those of Italy’s UniCredit. The troubles at the Danish lender may have further to run, and are harder to predict, than Rome’s political drama. Congress has made banks’ anti-money laundering a key concern. That bodes ill for Danske Bank, embroiled in a 200 billion euro suspicious funds scandal. The Danish lender is hardly a household name in the U.S. That gives politicians who wish to make an example of it free reign. The lender has been hit by police raids linked to clients’ alleged tax evasion and speculation its investment bank head could leave. Yet Panama Papers issues have thus far not meaningfully hit European banks. And Deutsche’s traders should have a decent 2019 – whoever’s in charge. Two former executives accused in the Malaysian corruption scheme openly lied to the bank, U.S. authorities say. Rival firms have found leniency in similar cases. But an indictment also cites a culture that favored deals over compliance. That could warrant a deferred prosecution. Oliver Bullough's book "Moneyland" delves into the parallel world of super-rich super-crooks, where rules are for the little people. He discusses wealth, corruption, tax havens and how to fix it all with Clara Ferreira Marques and Nicholas Shaxson, author of “The Finance Curse”. Former star banker Tim Leissner pleaded guilty in the Malaysian money-laundering scheme. The firm can cite his lies and deception. But fat fees from bond offerings should’ve raised red flags. U.S. authorities have punished Wall Street for past examples of poor oversight. Danish lender Danske has already lost its chief executive on news that one of its Estonian branches was used to launder Russian money. Now Nordea and others are facing questions. Plus: investors drive car stocks into a ditch - and Daimler's and Ford's dividends look vulnerable. The Danish bank said it faces a U.S. criminal probe over suspicious payments in Estonia. That raises the risk that it could be blacklisted in America, which sank Latvian peer ABLV, or be fined. Even a plausible $5 bln hit would send Danske’s capital ratio below its minimum level. CEO Thomas Borgen may have resigned after the Danish bank’s money-laundering scandal. But if he’s allowed to keep bonuses awarded during the time in question, Danske’s reputation will fall further. Its board has powers to claw back unjustified variable pay – it should use them. The Danish bank’s CEO has quit after an internal report said it ignored 200 bln euros in potentially suspect Estonian payments. With the threat of a hefty U.S. fine, pre-emptive head-rolling makes sense. Danske’s problem is it still doesn’t know how bad the problem really is. If the Danish bank’s fine for money laundering is in line with earlier transgressions by other banks, it would be manageable. But after a 28 percent drop in Danske shares this year, investors appear to be pricing in something worse. ING’s finance director will leave after the bank’s illicit fund failings incurred a 775 million euro hit from Dutch prosecutors. In the past, miscreants have got away with paying fines. Now shareholders are pushing the issue as well as politicians, accountability is improving. "Moneyland" takes a trip to the world of super-rich super-crooks, where borders are for wimps, taxes for little people and laws don't matter. Oliver Bullough's urgent polemic is deeply reported and engaging, even if it spends more time on the problem than on potential solutions. A new anti-money laundering directive seeks to plug holes in Europe’s leaky banks. But the rules don’t address the core problem of relying on local supervision. Until the EU can establish an independent AML authority, the U.S. will continue to act as the bloc’s de facto top cop. The liberal U.S. senator wants to prohibit lawmakers and cabinet members from owning individual stocks and permanently ban them from lobbying. Some of the ideas are over the top but her targets are entirely valid. Laying them out also strengthens Warren’s 2020 presidential pitch.